So basically, this is a topic whereupon we can discuss the Zelda Timeline in all its glory (such as it is). (For those of you out there groaning about this, move along. Nothing compels you to be a part in this discussion anyway.) We can talk about possibilities in the timeline - official and otherwise - in an effort to inspire anyone who is reading this to think of a logical placement of their fangame / fanon / fanfic idea into the timeline. It might even be helpful to current projects in placing these games into an established timeline instead of just copping out with "an alternative reality". My hope is that this can someday build into a linking together ( ) of projects and create an epic tale of multiple chapters, using projects on this site and more! The forum rules still apply. That is, no flaming, no spam, no vulgarity, etc. As discussion of a timeline branches just like the timeline itself, the idea of offtopicness would have to eventually be addressed. If a subtopic is introduced, we may have to move that discussion to another topic, or, if the need arises, have the moderators create a new sub-board just for this. FOR NOW, be sure that the SUBJECT of your reply matches whatever discussion or theme you want to take part in. Or combine multiple responses, but make sure that each part is legible and separate. We ARE allowed to disagree with interpretations. Everything here has to be may be based on evidence taken from within canon sources, a.k.a the games themselves. If you are going to include speculation or opinion, please be sure to label your thoughts as such, separated from hard evidence. More general rules may be applied, as edited by myself or admins/moderators, or suggested by anyone. Not sure what "EoC" means, or unsure what is meant by "canon"? No worries! Here's a list of acronyms and terms used in this topic, subject to updates! Feel free to post your own acronyms, too, to include new events or ideas referred to as the timeline discussion develops. .2 = Refers to a Second Quest or Hero's Quest mode for any game that has such a mode. "canon" gameplay = The official, suggested order of gameplay events to complete the game. Usually given as the suggested sequence in official Nintendo walkthroughs. HCW = Hyrulean Civil War (from OoT expository), in which Hyrulean tribes were unified by the King of Hyrule. Occurs 10 years before OoT. .c or .m = Refers to the comic or manga of any given game. For those with multiple comics/mangas (such as ALttP), more clarification will be needed. OoAp = Oracle of Ages, "Past" gameplay era. Occurs 400 years before OoA Present. More links (hehe!) as they come. Rule #1: Regardless of whether minor changes occur (see Bill #1), major changes in the past would create a new branch from that point onward. Rule #2: The sum total of changes in the past, even if multiple "major events" occur, still results in one new timeline, until the next time a traveler from the future jumps back into the past and enacts a major change. Rule #3: A new branch is created ONLY after a traveler from the future lands in the past and enacts at least one major change. Example: Link approaches Princess Zelda at the end of OoT, resulting in Ganondorf's capture, trial, and execution. Rule #4: Unless manipulated in some way, most time-travel in the game adheres to an "immediate return" rule. In other words, traveling from the past to the future back to the past would land the traveler at the exact same point in time that he/she left the past. Exceptions occur with recalibration of time-traveling devices, such as the quite variable Gate of Time in SS. Rule #5: Cameos and Easter Eggs do not justify placement on the timeline, if they are minor. Major "cameos" or "easter eggs" could be justified as other aspects that are pulled into the cycle of the Legend of Zelda, such as the reincarnation of Hylia in the forms of the many Princess Zeldas across time, Link always being a green-garbed boy, Impa being a caretaker or guardian to the incarnation of Zelda, etc. Seeing the Majora's Mask in ALBW or the Tingle doll in SS, etc., are counted as minor. The reference to the hero of the Gorons using a Bow to save them in TP is quite major. Rule #6: Once a past is branched - that is, when a major event occurs in the past - but the hero succeeds in undoing or preventing such an event, the branches remain separate. This effectively means that, while events in the future have to be preserved in order to allow the changes in the past to occur, one branch gets abandoned by the hero in order to save the other. Classic example: the entire reasoning behind the split of the Adult and Child timelines at the end of OoT. Note: These rules are subject to change and reinterpretation, just like the laws of any government. Amendments will be displayed as such. a) Changes to the past can superimpose onto the same timeline, with changes applying themselves slowly over time. Example: the Maku Tree's apparent destruction in the beginning of OoA, resulting from a Moblin raid on the Maku Tree's grove 400 years previous. b) Changes to the past can superimpose onto the same timeline, and any changes immediately take place. Example: the initial changes from Veran traveling into the past in the beginning of OoA, resulting in that cutscene of changes such as extinction of monkeys, etc. c) Changes to the past result in a new branch every single time the past is altered. Example: every interaction with a Timeshift Stone or Orb causes a new branch to be formed, allowing an infinite potential of branches. This allows the 'grandfather paradox' to be avoided, since the future person, if he/she travels into the past, is from an alternate future where the changes didn't occur. Obviously, this is a straight copy of the Hyrule Historia timeline, simplified for usage here. The proposed inclusions of ALBW and ALBW BS has caused some discussions of discrepancies in the BSs, creating heated debate after heated debate. Even so, other mismatches have caused plenty of head-scratching and confusion (It's super effective!! ), prompting theorists to outright reject this timeline as valid, despite its "official" status. I, too, have several bones to pick with this sequence of events. Hero of Time Saga: The Hero of Time Saga, which also includes the Hero of the Sky, the Hero of Winds, the Hero of Twilight, and the Hero of Spirits, but these are grouped together because of their traceable involvement with the Hero of Time legend. SS, for example, is the definite precursor. 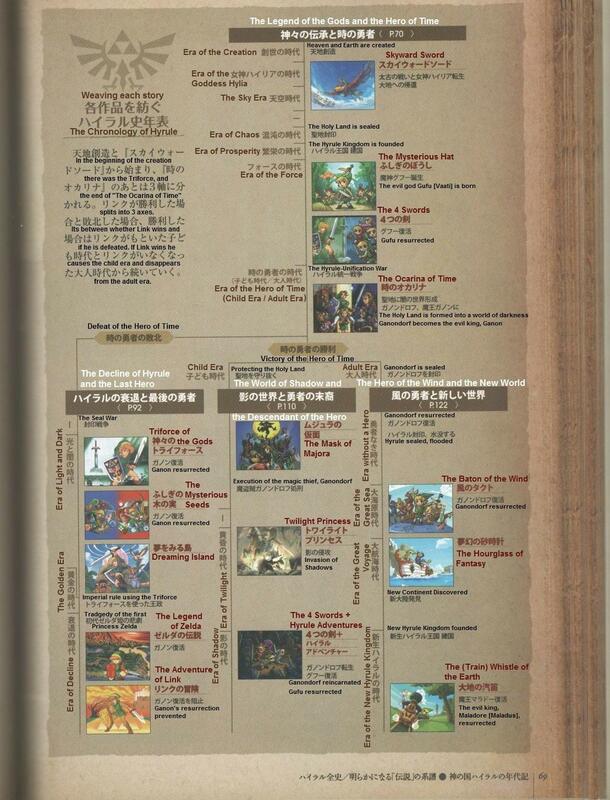 MM and TP are confirmed entries (well...) in the Child Timeline, and TWW, PH, and ST are most definitely part of the Adult Timeline. 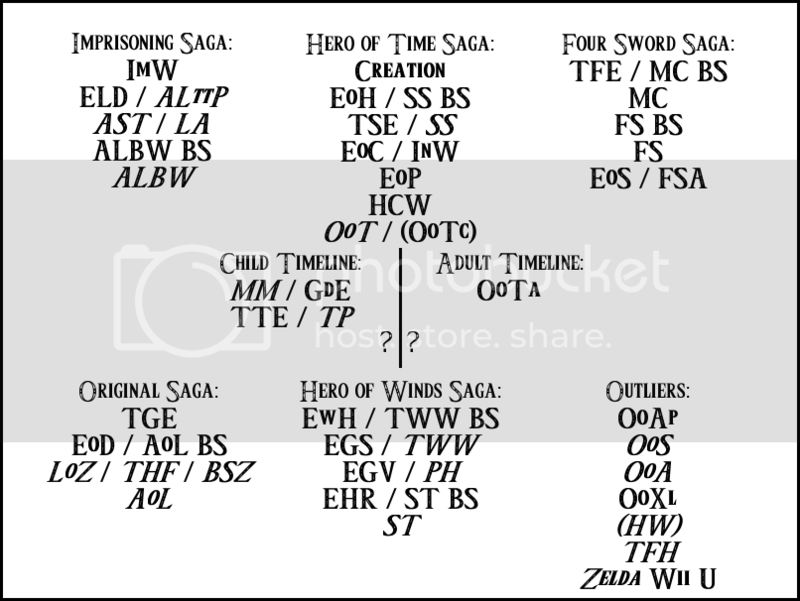 For the sake of discussion, TWW, PH, and ST are grouped elsewhere under the Hero of Winds Saga label. Four Sword Saga: The Four Sword Saga, which definitely stands apart from the rest of the series owing to the focus on a blade that is not the Master Sword, and a divine power that is not the Triforce. Also, the FSA Ganondorf UNDOUBTEDLY has a different origin story than the more infamous one from OoT. Hero of Winds Saga: See Hero of Time Saga note above. There are also included some outliers, whose direct placement cannot be easily rectified: OoX. OoX has some references to OoT and MM characters, but also items and circumstances from LA (due to the similar gameplay engines, items, etc.). ALBW, for reasons easily found on the internet, is also an outlier because of the BS: Ganon broke into the Sacred Realm and got the entire Triforce, THE FIRST TIME. Then Seven Sages AND the Princess of Hyrule AND the Hero of the era manage to fight against Ganon, take back the Triforce, and seal the Evil King away "into darkness". This is obviously not congruent with any other game yet released in the series. And now, with the inclusion of Tetra and the King of Red Lions in Hyrule Warriors Legends, it is unsure where HW will actually be placed. We also have the (as of yet) unreleased games of TFH and the still untitled Zelda Wii U. On the subject of inconsistencies, how about that line from Dangoro in the Goron Mines in TP regarding the Hero's Bow? It used to belong to the hero of the Gorons... but who was it? The Hero of Time 1) found the Fairy Bow in the Forest Temple as an adult, therefore taking place in the Adult Timeline, and 2) was not remembered as a "hero" in his lifetime (c.f. the Hero's Shade). So... why is this line here? The more useful solution, to me at least, is another break in the timeline, somewhere, somehow. Listing off the time-travel games in the series, we can see where discussion and justifiable timelines can be injected. OoA = Not really a huge factor into the rest of the series, seeing as the changes to the past become limited to the past... of the distant nation of Labrynna, not Hyrule. Listed are the major chapters and sequence of events, chronologically, throughout the game in "canon" order. That is, this is the order that Nintendo recommends the game be played, even though there is a bit of possibility to deviate and go through some of the Adult-era Temples in different order. More on that later. Question 1: At the end of the game, to what point in the past does Zelda return Link? This is a question that has no clear answer, but there are three distinct possibilities outlined in orange, blue, and red on the chart. This possibility makes the most sense if one takes the snapshot of Link in Zelda's courtyard as the definitive moment of the final cutscene, but the rest of the cutscene - AND THE GAME - needs to be clarified. First off, Link appears in the Temple of Time and the Door of Time closes as he leaves the Master Sword's chamber. Could easily be a magical manipulation of the future projected into the past - thanks, Princess - or could be more of a story-telling tidbit thrown in for dramatic emphasis. But the major problems with this possibility is that this means that 1) Dodongo's Cavern hasn't been cleared, 2) Jabu Jabu's Belly hasn't been cleared, 3) Bongo Bongo's seal is preserved, and 4) Nabooru's fate is unknown. Either Link has to quest to assist Darunia and Ruto and Nabooru anyway, with the foreknowledge of what to do, or the struggle against Ganondorf becomes burdensome enough to cause the Gorons' extinction and the Zoras' loss of the royal line. Either way, it could explain why Link himself was not present for the important event of Ganondorf's execution. This idea is more in line with the appearance of Young Link in the Temple of Time, but this one has its own problems. Namely, Link has possession of the four keys to unlock the Door of Time, but Impa and Zelda were being chased off by Ganondorf, likely still affected by bloodlust after killing the King of Town Hyrule (implied event). How Link meets up with Zelda in the courtyard again is confusing, to say the least, as it would mean she came back despite the danger from Ganondorf. I am personally of the opinion that Link took some time to return the three Spiritual Stones to their respective owners (giving Saria the Kokiri Emerald? ), allowing Ganondorf to see that his gambit failed and he retreated, allowing Impa and Zelda to return to Hyrule Castle. THEN Link tells Zelda specifically that their own plan was flawed, that Ganondorf was planning on letting them gather the keys to the Door of Time, just to usurp the Triforce once the Door was open. Link offers to return the Ocarina of Time to Zelda, but she lets him keep it, allowing the events of MM to happen. Oh, and Bongo Bongo's seal is still intact, and we have no idea what happens to Nabooru. Maybe Ganondorf retreated to the Gerudo Desert, and Nabooru took the chance to overthrow him and let him get turned over to Hyrulean authority, leading to his eventual execution attempt? In accordance with time-travel Rule #4, Link could have just been sent back to the point just after he last traveled forward. According to the 'canon' sequence of events, this means that Link succeeded in drying up the Kakariko Well, which could be a factor leading to Bongo Bongo's release later. If the events of the future are any indication, Bongo Bongo pretty much laid waste to Kakariko Village. If Impa, being warned by Young Link due to foreknowledge, was ready to battle the Phantom Shadow Beast, then the battle could've been a bit more violent... leading Kakariko to a destroyed state. Hmm, that sounds like that would explain what happened to Old Kakariko (the Hidden Village) in TP. Unfortunately, this possibility also means that Nabooru is captured by the Sorceress Sisters Twinrova, being brainwashed into serving Ganondorf. It is therefore unknown how Ganondorf then gets caught, and what happens to the could-have-been Sage of Spirit. Of course, the returning of the Spiritual Stones and the Ocarina of Time from the Blue possibility may still apply here. But still we must ask ourselves, what happens to Nabooru? And how does Ganondorf get caught to be executed? Question 1-1: When does Ganondorf enter the Sacred Realm? It's all "part of the plan". We don't know exactly when Ganondorf passes by the hero-in-stasis and enters the portal to the Golden Land. It could have been one minute after Link opened the Door of Time; it could have been one hour, one day, or even a year! (I might interject that he could also easily enter while Link keeps the Door of Time open while questing to Kakariko Well or the Spirit Temple...) The point is, that this opens up the possibility that Zelda sends Link back in time, and he arrives... after Ganondorf already entered the Sacred Realm. The Door of Time is sealed shut while the Gerudo King is still ON HIS WAY to the Triforce chamber, and the access to the Golden Land is closed... Ganondorf is effectively stuck inside the Sacred Realm with the Triforce, but no way of getting out. No. No way of getting out. ...You done yet? Did you find any place that lets you travel from Dark World to the Light World? No? Only through the use of the Magic Mirror? Hmm. Guess what Ganondorf didn't have in his possession? You could say that now he's... SEALED in the Dark World! Indeed, Ganondorf might have received the Triforce in full, but being trapped in the Dark World, he could only his influence to spread his evil in the Light World, remotely. Indeed, the BS for ALttP (the SNES manual version) distinctly depicts this circumstance, allowing me to just flat-out say that this newer possibility - represented by purple and by the ALttP depiction of Ganon in the chart above - leads to the 'Imprisoning Saga' and the ImW. Question 2: Does time-traveling count as a 'major change' - according to Rule #1 - during the Shadow and Spirit Temple quests? Impa is not awakened as a Sage... Technically, since this timeline is abandoned, Bongo Bongo has the run of Kakariko Village. It is unknown whether the beast is downed later, or what. Nabooru not awakened as a Sage... Link has not encountered her yet, since he'd have to travel through the Haunted Wasteland first, and he does not yet have the Lens of Truth. It can be claimed that because Nabooru was blocked by the Spirit Temple's "tiny passages", which only Young Link could enter, and because she could not reach the Silver Gauntlets, that she might have gone elsewhere to enact another plan to upset Ganondorf's schemes. One could also argue that she got captured by Twinrova anyway, and is still brainwashed and a loyal member of Ganondorf's army even though Link had not changed the past yet. Nabooru not awakened as a Sage... Link has not encountered her as a child yet, since it would require a trip into the past first. It can be claimed that because she was blocked by the Spirit Temple's "tiny passages", which only Young Link could enter, and because she could not reach the Silver Gauntlets, that she might have gone elsewhere to enact another plan to upset Ganondorf's schemes. One could also argue that she got captured by Twinrova anyway, and is still brainwashed and a loyal member of Ganondorf's army even though Link had not changed the past yet. The dialogue of the Gerudo within the Fortress in the future heavily suggest that Nabooru is indeed brainwashed by Ganondorf's surrogate mothers, so I wonder if this branch is even a possibility. No matter which of these two possibilities occur, Link abandons the two branches, leaving Hyrule to fend for itself, and Ganondorf remains very much in charge, largely unopposed, though he can no longer nab the Triforce of Courage, as Link took it into the past with him. Link abandons this branch after defeating Ganon, leaving Hyrule to fend for itself. He takes the Triforce of Courage with him. Ganondorf sealed away into the Sacred Realm, taking the Triforce of Power with him. The events of Wind Waker follow, according to the BS. What happens with the Triforce of Courage? ...I honestly don't know. I would assume that, in the Child Timeline, Link still bears it, and passes on its essence to Link of Ordon (TP), who is blessed by the Goddesses into transforming into the 'sacred beast' instead of succumbing to the Twilight. In the Adult Timeline, however, there is no Triforce of Courage. I wonder then if Zelda took the Triforce of Courage from Link as he traveled back in time, and the Princess was the one to shatter the Triforce and hide it across the land of Hyrule (similarly to the plot of LoZ) before the return of Ganondorf. Basically, the question has to be asked, whether the Triforce CAN travel through time, or if it remains in 'hammerspace' until its bearer returns to the era. If the Triforce CAN travel through time, that would explain SS's ending, but not OoT's. If the Triforce CAN'T travel through time, then OoT can be salvaged by throwing SS under the bus. A solution must be brought forth, before this question can be resolved. I honestly have no further ideas to offer on this subject. 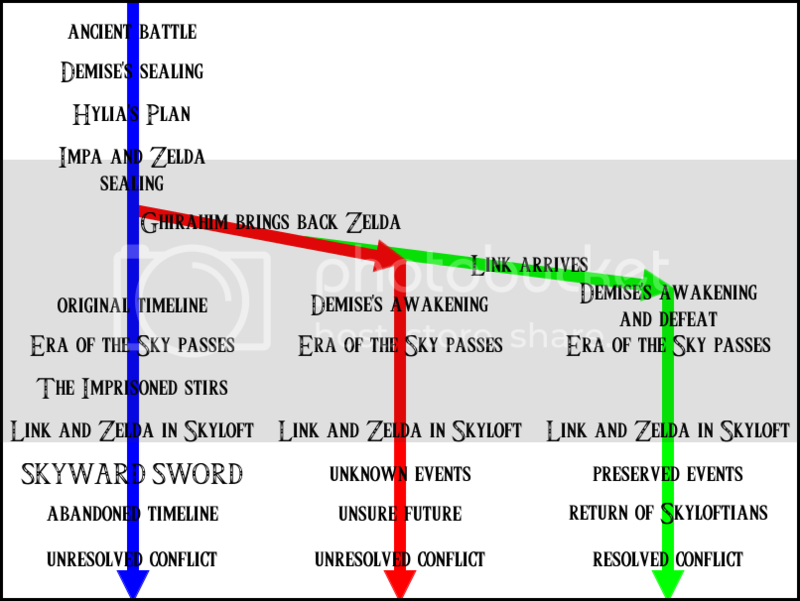 Depicted is a flow of events, chronologically speaking, of simplified events in, around, and alluded to in Skyward Sword. There are three major lines or branches that occur as a result of time travel, coded by color for easy reference. Blue Line: the original timeline, with all minor time-travel changes. Even Impa and Zelda traveling to the past is considered a minor change, as it makes the entire story possible. Even if that seems like a paradox, it is certainly acceptable, because of Bill #1a. This is the branch where the majority of gameplay occurs. It is also in this branch that Link forges the Master Sword, obtains the Triforce, and destroys The Imprisoned via severe head trauma. Red Line: Aptly named, this is a major change as a result of Ghirahim stealing Zelda away into the past in order to unseal Demise. The ritual works, but the question remains: what would happen at that point? In-game, we never learn, since Link manages to travel back after Ghirahim and defeat both the Demon Lord and the Demon King, resolving the conflict. But you gotta ask yourself: what would happen? If Link opts to return to the future, he would still return to the Blue Branch, since Demise had not succeeded in conquering the world or the Triforce (yet? ), making the Gate of Time an anomaly in terms of conventional time-travel. Green Line: Due to Ghirahim kidnapping Zelda, Demise gets awoken in the past. But the present according to Link, Groose, and Old Impa shows that immediate changes haven't occurred. Either this violates Bill #1b, or a major branching occurred, adhering to Rule #1. Adherence wins, so the question remains how Link managed to travel back in time and land on another branch? The answer is that Link traveled back to the point before the major change (Demise's revival) occurred. This would be an acceptable exception to Rule #4. Link takes the Master Sword and the Triforce away from this branch and into the Green one. The Imprisoned was sealed for hundreds of years, then destroyed by the power of the Triforce. Ghirahim takes Zelda out of this branch. 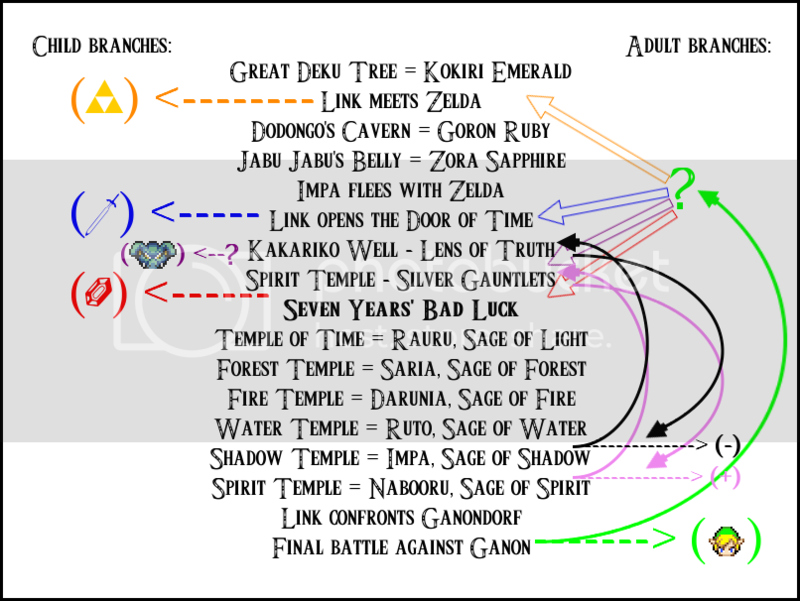 Link, Zelda, Ghirahim, and Groose are taken out of this timeline due to time-travel to another branch. Afterwards, they are not able to return to this timeline. It is unsure if Skyloftians could also begin to return to the Surface here, since the conflict of the past continues unresolved through TSE. If it does, then Gaepora must lament the loss of his daughter, never to see her again, and the humans would have to fend off occasional leaderless demon raids (Ghirahim's gone, remember?). Demise awakens. It is assumed then that he continues his campaign against the humans, but the means remain unknown, as his army is earth-bound. He can continue the fight against the other Surface-dwelling tribes, but until flight is developed, he cannot attack Skyloft and obtain the Triforce that still sleeps there. According to the 'Demise's revival' cutscene, Zelda would have been killed after the ritual was complete. Technically, two Ghirahims must exist on the world at the same time: One that came through time, and one that was natively there. There would be no Imprisoned, as Demise was freed. If Demise's forces are stopped for the centuries of TSE, then Skyloft continues relatively unimpeded. Link and Zelda remain in Skyloft, but Zelda needs not be taken away by Ghirahim UNLESS the Demon Lord needs his younger self to repeat the events of his 'past' and obtain access to Skyloft through a trap for Link. From that point on, assume the worst. Basically, it is unknown what happens from that point onward. Two Triforces exist at the same time in the past: one still sealed in the Sky Keep, and one sealed within the Temple of Hylia. Likewise, there are two Master Swords: the Goddess Blade in Skyloft, and the Master Sword sealed in the Temple of Hylia. The events of SS are implied to repeat themselves in order to preserve the past, but the obvious and necessary absence of The Imprisoned must be noted, as Demise was destroyed completely in the distant past. When the three Skyloftians return to the future, it is basically a copy of the Blue Line, only with the altered history. Old Impa expires, Groose returns to Skyloft (implied, but not definite), and Link and Zelda remain on the Surface. It's easy to see with these outlined points that SS provides at least three branches that Nintendo could have the possibility of building upon. goddamn man, you really went to town on this! MG-Zero, when it comes to a timeline as intricate and long and involved as Zelda's, ya can't half-*** anything about it. ... you really went to town on this! Updated some posts based on the newly-revealed TFH and HWL. I'm also noticing that nobody is adding to the discussion besides me. I'd hate to monologue here. Updated some images, and by extension some posts. Why is nobody else responding?! Wow, I had no idea the timeline of Zelda was so detailed. Hmm. One thing I've largely been curious about regarding the timeline is the impact of AoL. It's stated that Ganon will return if Link's blood is sprinkled on his ashes. What I'm wondering about is, would even a little blood do? Or perhaps the forces of darkness could take Link out when he gets old? Either way, would this not mean that Ganon could be revived at any time? What if... this was the reason of the backstory for Wind Waker? The Hero never returns when Hyrule is once again in danger... because he died to Ganondorf's followers? And they revived the King of Evil..?